cover adorned with the sweetest angel image! These two items are now in my Etsy shop. Hope your weekend coming up will be just what you are wishing for. Labels: Art Angel lace and fabric doll - Jeanne d'Arc inspired. Angel journal. Such gorgeous artwork, Suzy. I checked your Etsy shop and the blank journal is already sold! Good for you. As always, a big thank you for sharing your beauties with us, your adoring viewing public. Love everything you create. Suze, YOU inspire me. Just beautiful work. Thank you so much for always sharing your creations. Oh my gosh, the angel is beautiful! Gorgeous angel and journal. Your talent takes my breath away. Hello sweet dear Suzy, -your new angel is as amazing as the first one, so pieceful resting in her wonderful laces, and beauty. 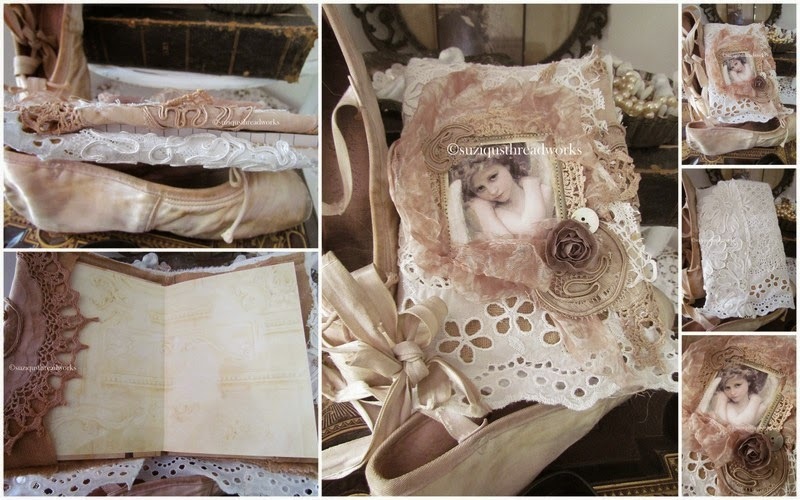 And the journal is so very adorable, with the dear angel image,and lovely pinkish /white fabrics.A gorgeous piece to fill with thoughts of love and beauty, dearest friend. aaaah.....the beach. I definitely envy you as we are currently sitting with at least 15" of snow. Never mind - the sight of your angels makes me forget what's outside the window! Suzy, What beautiful creations. You have such a knack for colour, and putting it all together. I Love your angels! They are just so sweet and "angelic"! I am making some ornaments for our grandgirls that are Princess ornaments, They are reminders of the Last Christmas gift we gave to them! These give me such great ideas about what to do in making theirs. Thanks for coming by my blog! I am posting again. I have been enjoying your posts, just not posting anything on my blog! I'm not normally an "angel" person, but you've made this so beautiful Suzy! Almost 3d with a 1d graphic as the focus! Clever and very well done! Snap, almost.... with the ballet theme. :) I've just posted and I have a ballet piece in it, but oh my, nowhere near as beautiful as yours! and another angel! Maybe you're converting me Suzy. lol.